Remove the crossbar pad and ensure the front forks are rotated with the bleeder screws at the 12 o’clock position. Remove the bolt(s) that secure the front number plate to the triple clamp. Using the appropriate tool, remove the bleeder screws on the top of the front fork(s). 5. Using a 7mm (KTM/Husky) or 8mm (Honda,Kawasaki, Yamaha, Suzuki) open ended wrench, CAREFULLY thread the “L shaped” fitting into the fork and tighten the “lower fitting”. Tightening the “upper fitting” can cause damage. 6. Place the AirPro manifold (or manifold with bracket attached) on top of the existing threaded hole(s) in the triple clamp. In some cases, you may need to use the longer bolts and spacers to align correctly. 7. Connect the manifold to the “L shaped” fittings from step 5 with the provided air line (trim the line to a sufficient length to avoid kinks or excess line). * Ensure air line is “bottomed out” into all fittings. To release the line from the fittings, press the collar inward. 8. For bikes with headlights, you may choose to use the provided schrader valve extension when adding air to your AirPro. It is not recommended to leave the extension on permanently, only use to make pressure adjustments (see examples below). *NOTE: For bikes with air forks, only one side of the AirPro will be connected to the fork. 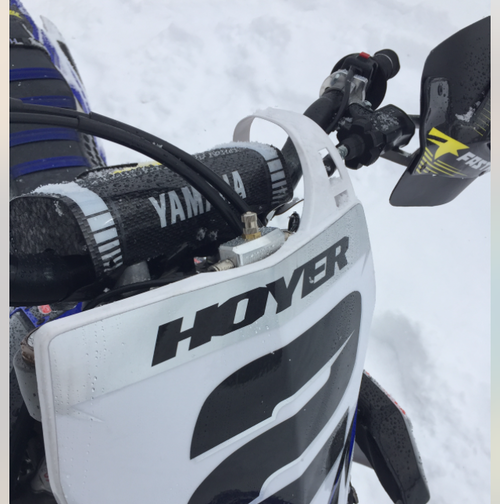 Brock Hoyer's YZF 450. All Yamaha kits mount very similar to what is picured here. 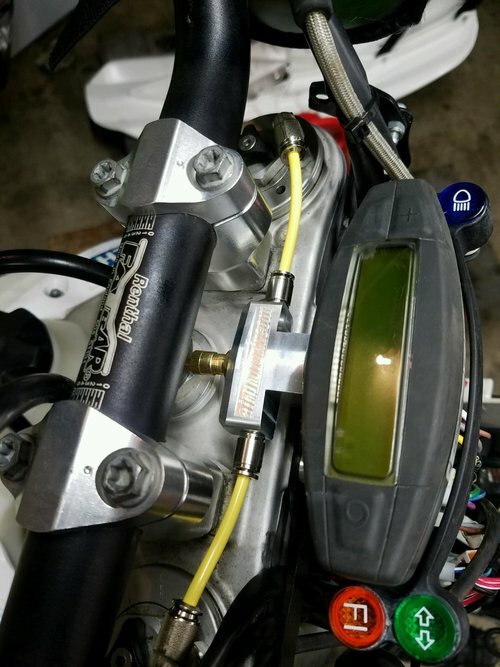 This is the best mounting position for KTM's with odometers and stock headlights. If your bike has aN UNDER BAR stabilizer, see the picture to the right. ALTERNATE MOUNTING POSITION, MUST REMOVE HEADLIGHT SURROUND TO MAKE PRESSURE ADJUSTMENTS. 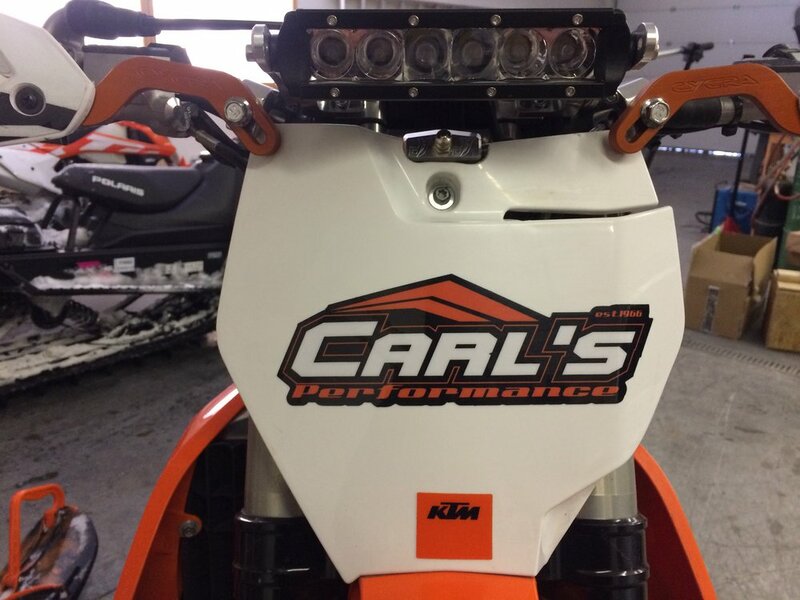 Standard flat number plate with light bar, valve points TOWARDS THE FRONT OF THE BIKE and is mounted at the number plate bolt on the triple clamp. 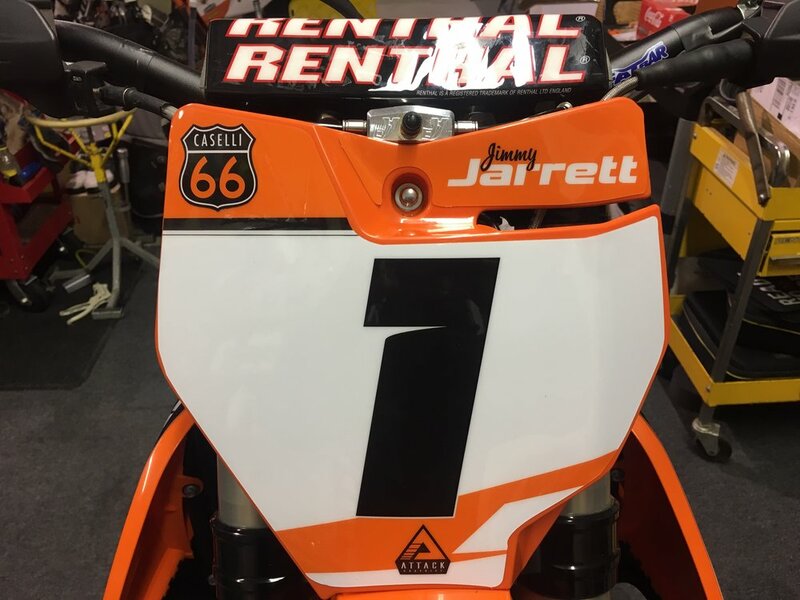 Jimmy Jarrett's KTM 450 SX-F. KTMs with no accessories and a flat number plate will mount at the number plate bolt, and valve pointing forward. 2009 and newer CRF 450r mounting looks similar to the YZF mounting position. Use this position for 2018 and newer CRF 250r as well. A top view for all Honda kits that come with the mounting bracket. The bracket is mounted the same place on the triple clamp as the number plate.